Reader Ed Dietrich sent us these postcards as a follow-up to what we’ve shared of the late Kalmenoff’s artwork for The Golden Stamp Book of Animals of the Past and Sinclair Oil’s Exciting World of Dinosaurs booklet. Ed says these cards from publisher Dover bear a 1985 copyright date, which means they come from a book you can still get inexpensively on Amazon: Dinosaur Postcards in Full Color. The complete set contains 24 postcards. Here are five to whet your prehistoric appetite! Sinclair and the Exciting World of Dinosaurs! 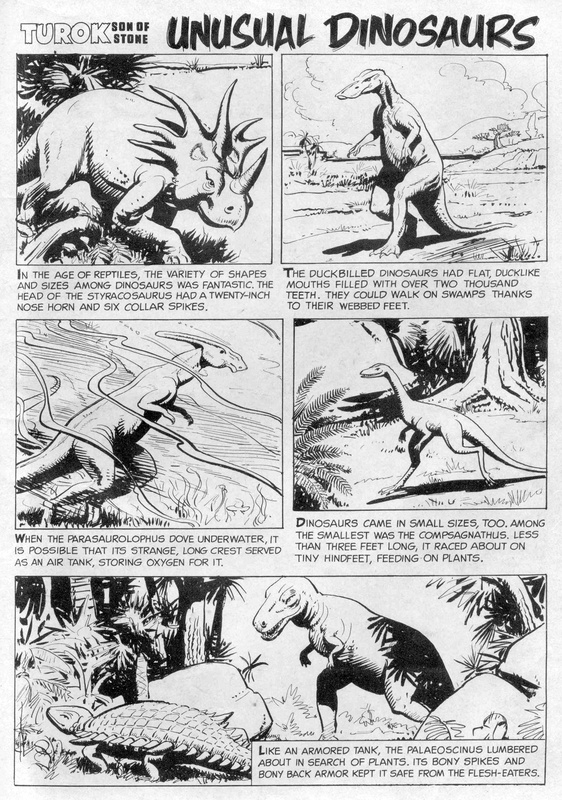 Today’s gallery showcases the complete 1967 booklet “Sinclair and the Exciting World of Dinosaurs.” Another one of Sinclair‘s famous free dinosaur promos, this one’s packed with great paintings on every page. Since 1967, paleontology has updated our vision of these magnificent creatures. In 2005, for example, we found evidence of feathers on the tail of a tyrannosaur. William Stout included this incredible update in his tyrannosaur mural at the San Diego Natural History Museum. Now we conceive of their tails not dragging heavily on the ground, but in far more alert and active poses. Still, these 1960s paintings are a lot of fun. Thank you to reader Edward Dietrich who, in 2017, told me of an earlier printing of this booklet dated 1964, released for the Sinclair Dinoland exhibit at the New York World’s Fair, 1964-1965. He sent the following three images, which are that edition’s cover and two additional pages illustrating the exhibit. Have you seen my scans of photos from Sinclair at the 1934 Chicago World’s Fair? “Kal,” as he was known to his fellow artists, was employed at the AMNH from the 1950s through the early 1970s. His work can be found in the Hall of North American Forests, the renovated Hall of North American Birds, and in the Small Mammal Corridor of the Hall of North American Mammals. Reader Edward Dietrich adds that Kalmenoff also contributed color illustrations to a wonderful Golden Stamp Book book I loved when I was a kid: Animals of the Past. Thank you for reminding me off this forgotten treasure, and revealing its connection to the Sinclair booklet! Collectors and prehistoric animal enthusiasts can sometimes find this book on eBay and Amazon. Kalmenoff’s paintings from this 1970s book, along with black and white line drawings by Robert Gartland, appear to be recycled from a 1950s edition called The Golden Play Book of Animals from the Past Stamps. You can find scans of many of that edition’s interior pages and stamps at the blog Love in the Time of Chasmosaurs. Kalmenoff’s painted mosasaur stamp rocks my world. I want a wall-sized version. And how can you not love the Skull of Uinta Beast? 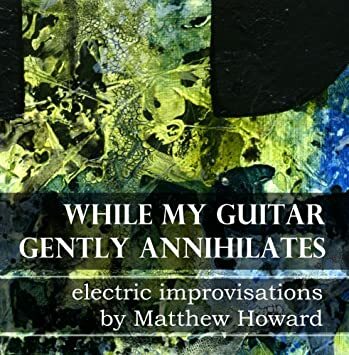 It’s a doom metal album cover! This is a charming book even if it makes numerous outdated statements about dinosaur biology, such as depicting brontosaurs spending all their time in water. 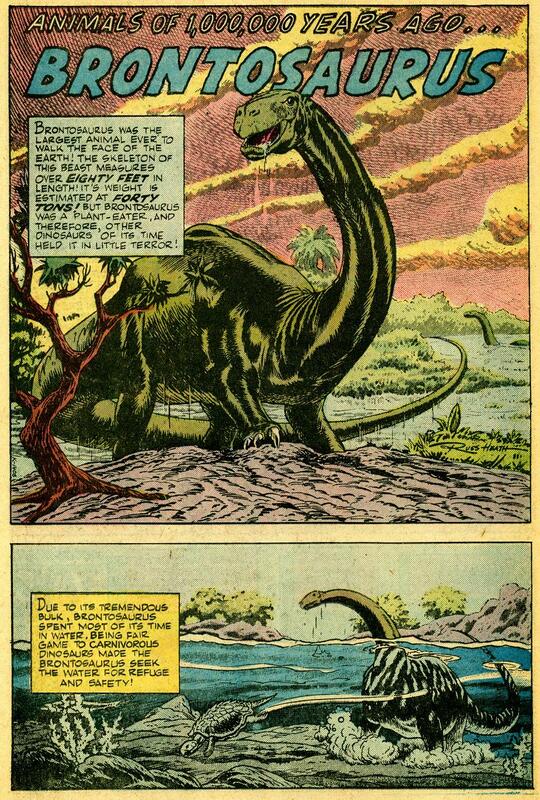 For a more current take on brontos, you’ll need Ted Rechlin’s awesome graphic novel, Jurassic. And now, without further ado, please enjoy the complete 1967 edition of “Sinclair and the Exciting World of Dinosaurs!” Featuring brontosaurus, struthiomimus, trachodon, tyrannosaurus, triceratops, ankylosaurus, corythosaurus, ornitholestes, and stegosaurus. WOW! If, after all that, you are dying to see more paleoart from Matthew Kalmenoff, you’ll dig his black-and-white drawings from the 1956 book, All About Strange Beasts from the Past (written by Roy Chapman Andrews). Yes, you can find it on Amazon. But for samples of the interior, visit DinosaurHome, where we got the following images. If you thought Kalmenoff’s “Skull of Uinta Beast” stamp was doom metal, then check these out! Romeo Tanghal Dinosaur Art – Brontosaurus! Sweet splash panel by Romeo Tanghal for a Weird War Tales story featuring dinosaurs. You never knew dinosaurs were blue, did you? Tanghal did several splashes for the first page of Weird War Tales. All of them feature the skeletal figure of Death. They provide an introduction and framework for the story. 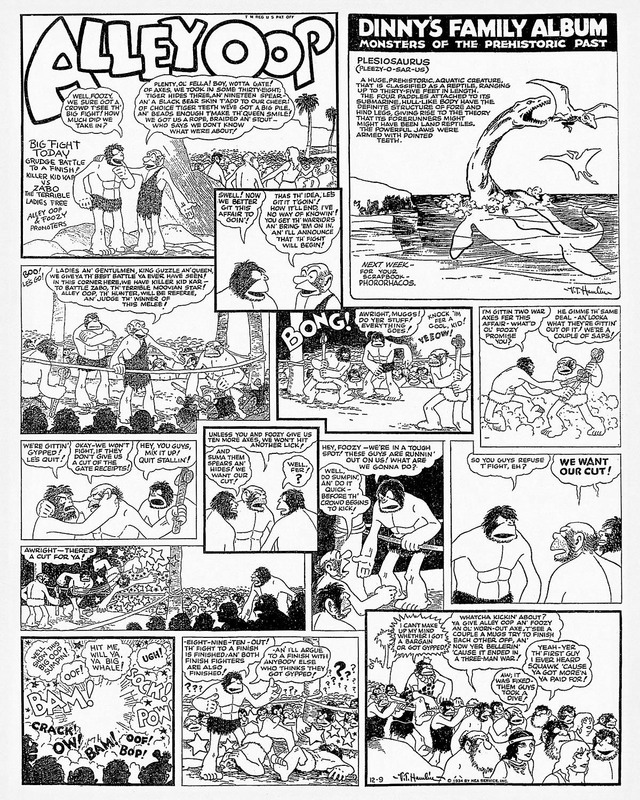 They also set up the war comic as not being pro-war but as a critique on the violence and absurd fatality of war. Many of us remember Romeo Tanghal for his work on the Teen Titans with Marv Wolfman and George Perez. 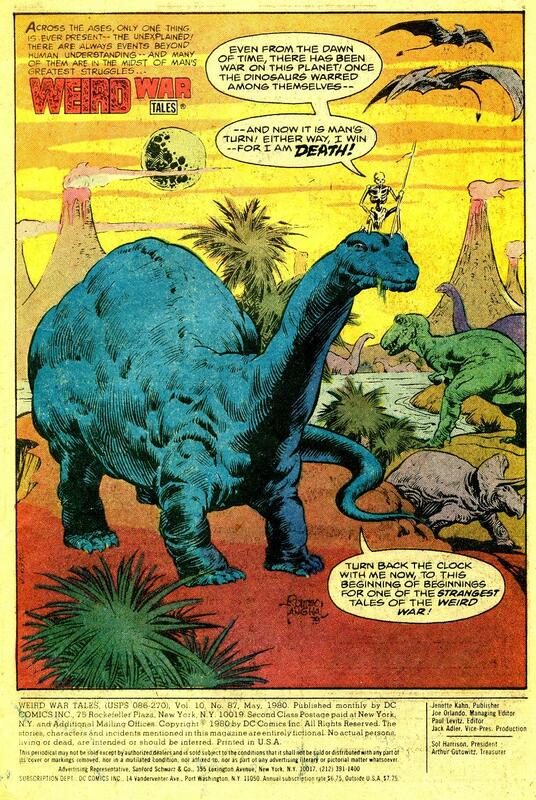 Russ Heath Dinosaur Art – Brontosaurus! 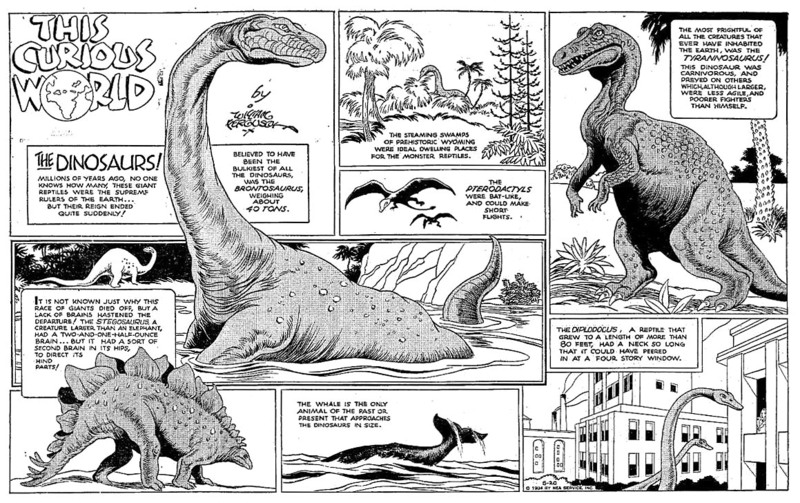 Russ Heath dinosaur art from Tor Volume 2 #5. *Dinosaur enthusiasts will note that this beast’s name was changed to Apatosaurus before the 20th century was over.